Kvant 1 was a 37KE type station module for the Mir space station complex launched with a FGB-type Experimental Modular Transport Ship (TKM-E) space tug. Kvant 1, a specialized space module, linked up with the space station Mir. With the advent of the Mir space station in 1986, a new requirement for permanent expansion of the orbital complex was set. In 1987 Kvant 1, a specialized module left over from the Salyut 7 program, was attached to Mir not only to provide a complex set of scientific equipment (the international Roentgen X-ray Observatory consisting of the HEXE, Pulsar X-1, Sirene-2, and TTM instruments; the Glasar UV telescope; and the Svetlana electrophoresis unit) but also to enhance space station support systems, in particular attitude control via six large gyrodynes. When attached to the aft docking port of Mir Kvant 1 measured 5.8 m in length and 4.2 m in diameter with an initial mass of 11 metric tons. The 37KE-type modules were designed for delivery with the Buran orbiter, so no propulsion system was included. For delivery with the Proton-K rocket, a TKS-type space tug (TKM-E) was included, which handled the free-flight phase and the docking. 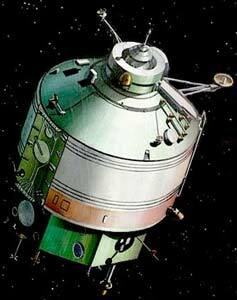 The TKM-E was discarded after docking with the Mir station. HEXE (High Energy X-ray Experiment) - (Four detectors, 15-200 keV.energy range, 1.6 x1.6° field of view, max. time resolution 0.3-25 ms) Provided by West Germany. TTM Coded Mask Imaging Spectrometer - a wide-angle camera that used a coded aperture mask to determine source location. (energy range 2-30 keV. 7.8 deg × 7.8° field of view, 2 arcminutes angular resolution, 1 sec time resolution) Provided by the Netherlands/UK. Pulsar X-1 - 4 phoswich detectors (20-1300 keV.energy range, 3 × 3° field of view, max. time resolution of 10 s) Provided by the USSR.